Last night, on my way driving home from the gym, I was incredibly tempted to pick up my cellphone and text. I had just gotten a couple of messages, and I was sitting stopped at a traffic light – what’s the harm, right? Well, just as I was about to grab my phone, I noticed a police car roll up to my side. It was a close call! But what would have happened had the policeman seen my fiddling with my iPhone? 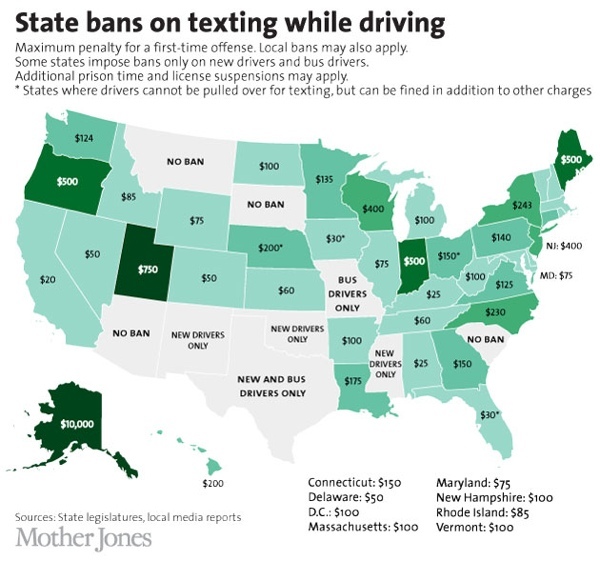 As it turns out, texting-while-driving penalities vary widely from state to state. According to a new state-by-state analysis by Mother Jones, I would have gotten off easy – the offense carries a $20 base fine in California. But had I been driving in Alaska, I could have been facing not only a $10,000 ticket, but a year in prison as well. It may seem somewhat ridiculous that a simple text could carry such a stiff fine. But remember, more teenagers will die this year from texting behind the wheel than from drunk driving. 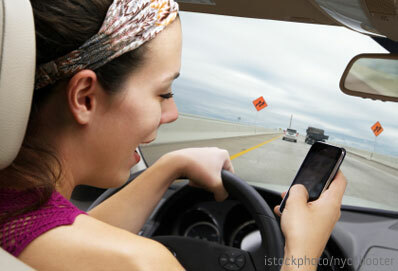 And a recent research study shows that even hands-free texting is more dangerous than drunk driving. Most states’ penalties fall somewhere between California’s lax $20 charge and Alaska’s brutal $10,000 fine – the median national penalty is $100. But it’s important to remember that we’re only talking about base fines. Many states, counties and towns tack on extra fees and penalties to traffic offenses. Text while driving in Los Angeles, for instance, surcharges drive that smallest-in-the-nation fine all the way up to $159. You might also see your car insurance rates rise, as well. Despites these ‘minor’ inaccuracies, the Mother Jones analysis should be required reading to anyone with a set of car keys and a mobile phone. No text message is worth getting into an accident over. And certainly, no text message is worth going to jail over, either. How ever did we survive? I remember when there were no cell phones! How did we survive that 30 minute drive to work without calling 3 people, sending a text “I saw a deer today” or any of that!?!? We did it because that call couldn’t be made - and it’s not NECESSARY to make ANY calls - or answer ANY calls… not ONE excuse. Even if it’s your kids - I’m sure they’d rather you were alive than answering that call that exact moment. Pull over and call them right back - no death for you or me! We survived without our parents answering the phone or texting us when we were apart! Seriously, we need to get off the phone, not eat, not do makeup, not surf the radio - just drive. Fines? Seriously, I don’t care if there’s a fine - because I won’t be paying one, because I’m not stupid enough to even pick up my phone in the car. (and no, I don’t do makeup, eat or mess with the radio either!) So, why complain about fines (I went to the link in your post and read some comments)? Fines don’t matter if you are not doing the “crime”! I don’t care at the airport I have to remove my shoes and go thru metal detectors - because I am not carrying an explosive or a knife - or any other item that can kill everyone on board. I be those on 9/11 would have been happy to stand in line and got through security checks if they knew they would still be alive and with their loved ones today! Sorry, drinking and driving and texting a driving are “soap box” areas of mine! JUST DON’T DO IT! I forwarded this to my kids. Whenever I am driving and notice a car going 30 miles under or over the posted speed limit and weaving from one lane to another I am certain it is another caller or texter waiting for a major accident. Yes the state of Florida has finally enacted a no texting while driving law, BUT it is being classified as a second class infraction or only if there is another infraction. So the new “law” is practically worthless. Although there is no statewide ban on cell phone use, there are some strict laws at the local and county level in Montana. Within the city of Billings, for example, a family member of mine was fined $110 just for having his cell phone in his hand while driving. Yes, even if a state does not have a specific law against hand-held phones, many can still get you on a related charge, such as distracted driving, unsafe operation of a motor vehicle, etc. The only difference is that those charges may be slightly easier to fight in court, since they’re more subjective.